Sometimes, I can spend hours searching the web for interesting crochet patterns. As I've mentioned before, I really like the blog, Moogly. Blogger Tamara Kelly has some wonderful free crochet patterns. Over the holidays, I used a simple Moogly pattern for stars to create some crocheted jewelry. Another great place to find excellent free crochet patterns is Ravelry. 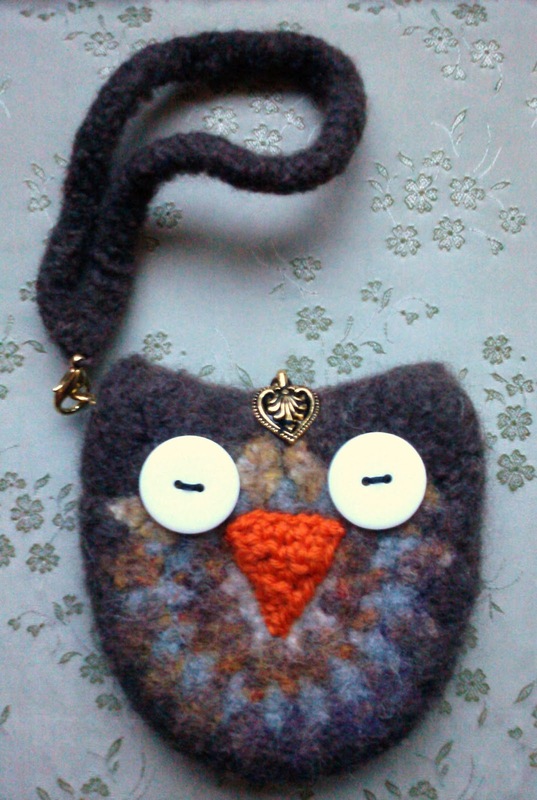 I found an adorable owl key chain pattern by Yarn Artists. 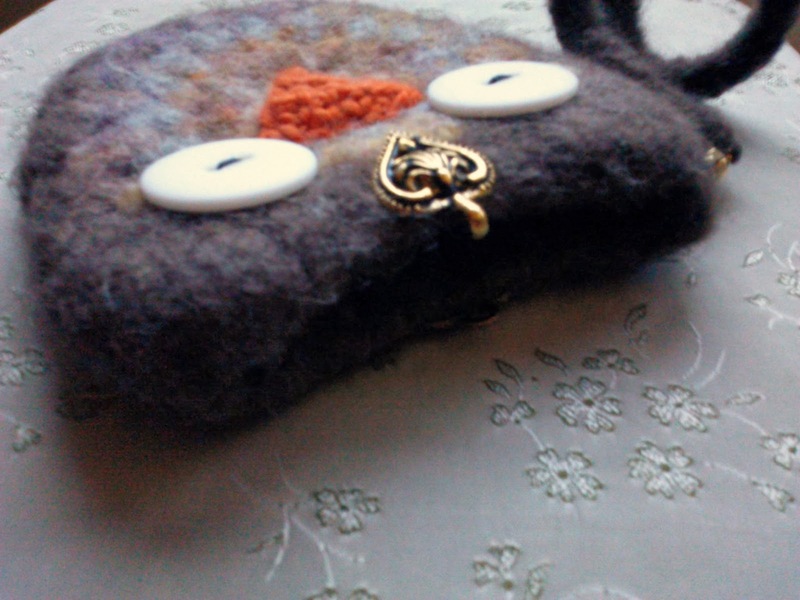 I used the pattern as a model to create this crocheted, felted owl wristlet. 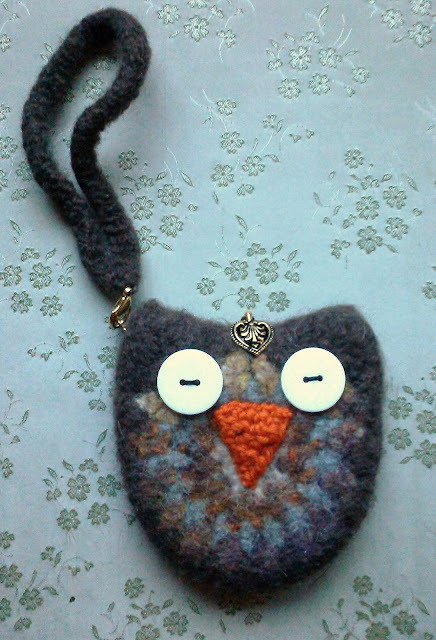 Basically, I just crocheted the owl on a much larger scale using bulky-weight, wool yarn. Instead of embroidering a beak, I crocheted a triangle and sewed it in place. 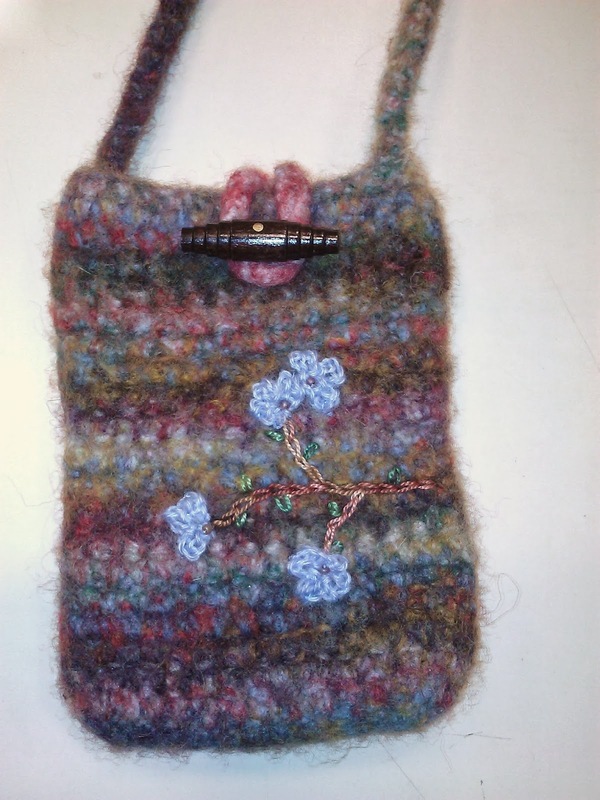 I attached a two-piece, metal hook and eye clasp to the top, providing an easy way to keep the purse closed. I also made a wrist strap equipped with a lobster clasp that can be attached to the ring portion of a toggle clasp that I sewed to the bag. Scrap Happy: Felted Crocheted Brooches from Wool Yarn "Leftovers"
As you may recall, I've been a bit obsessed with felting in these cooler (well, recently COLD) months. 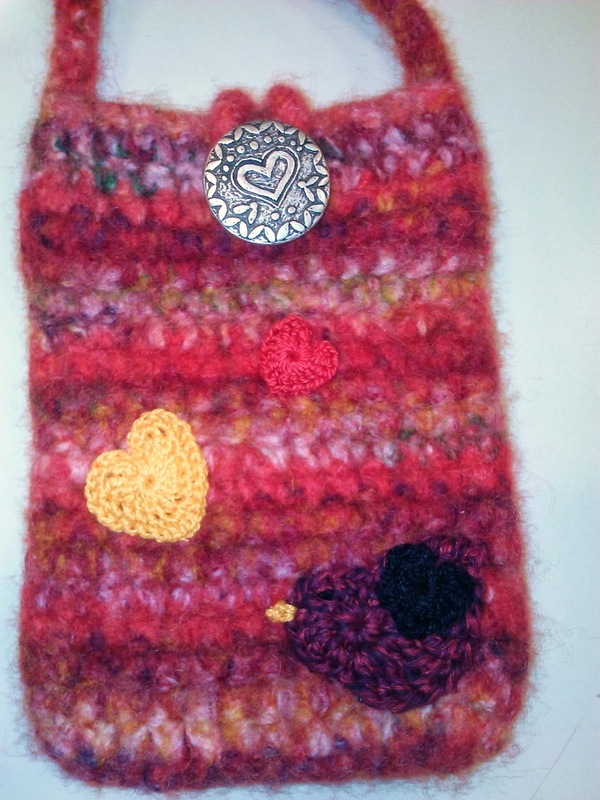 As a result, I've developed quite a collection of "leftover" wool yarn from my felting projects. I thought I'd experiment a bit and see what I might be able to use them for. With all the spending on holiday gifts, it's nice to come up with ideas for things I can create using materials I have at hand. 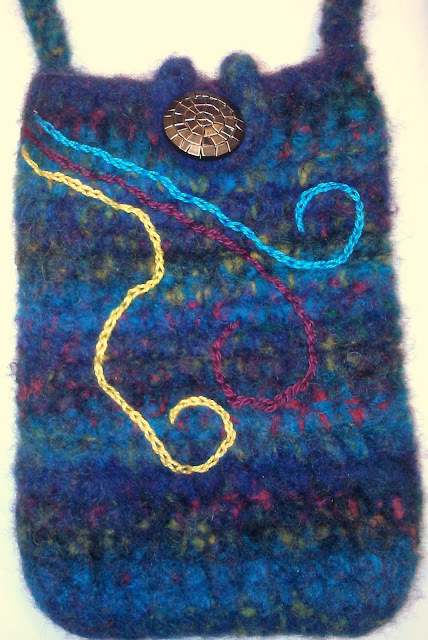 I've mentioned before that I really love Paton's ColorWul for felting because of the color mixes that result in the finished piece. I used some of the scraps of that yarn that I had accumulated to crochet and then felt five different motifs - two different types of leaves, a triangle, a flower, and an oval. Here are photos of four of those shapes, unadorned, before doing any additional embellishment. The first brooch that I've finished utilized the other leaf shape that I crocheted and felted. The Paton's ColorWul shade here is Ocean. The reddish border around the leaf edge was created as a result of slip stitching around the edge of the leaf before felting. The red color is one of the colors of the striping in the yarn. I embellished the basic leaf shape by embroidering red glass beads down the center vein. I then used metallic embroidery floss in a blended shade (Caribbean Ripples from the DMC Light Effects Blended Favorites Floss Pack), that picks up the colors of the yarn, to chain stitch the veins that fan out from the center, as well as for the stem. I hand sewed a pin back to thick wool felt, and then sewed that to the back of the leaf shape to complete the brooch. So, one down and four to go! This was an enjoyable project and I am looking forward to coming up with fun ideas for completing the rest of the brooches. 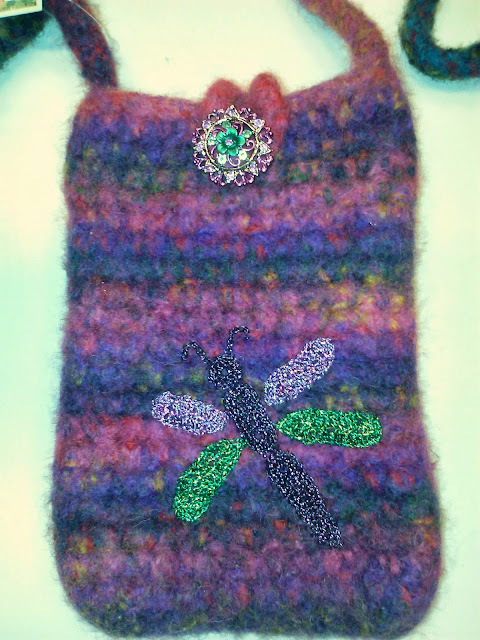 One of my favorite crochet websites is Tamara Kelly's blog, Moogly. 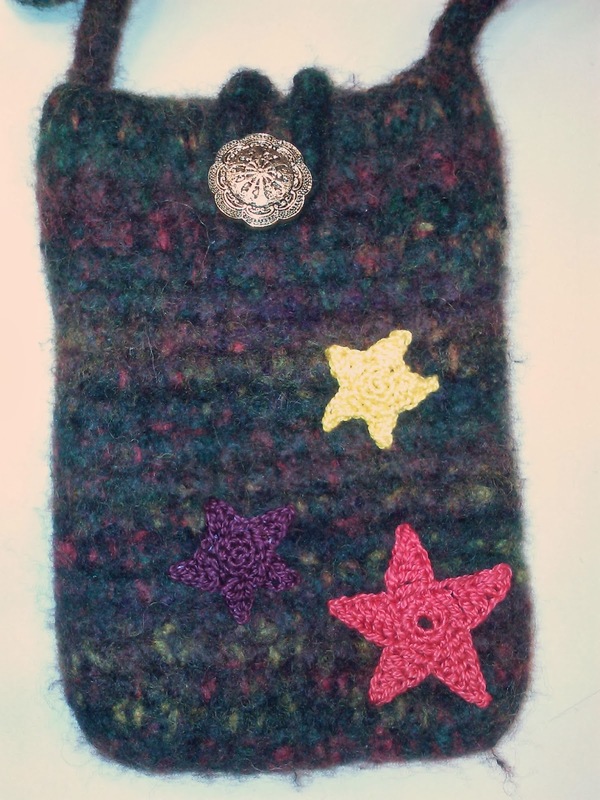 Recently, she posted her pattern for Glittery Crochet Stars. They looked so simple, yet so pretty. I immediately thought about their potential use in jewelry. As I've said before, I really like the look and feel of thin wire and metallic thread crocheted together, so I decided to try crocheting Tamara Kelly's stars using those materials. I love the way they turned out! I combined them with Swarovski crystal stars to create this necklace in silvery shades and this bracelet in gold and burgundy. I have some Christmasy gold, green, and red metallic thread. I think I'll combine it with red wire and try some holiday star earrings next! Looking over my posts for the past couple of months (and yes, I realize I've been delinquent in posting lately, but I am just so baconey* busy), you might come to the conclusion that I've become obsessed with felting. While I've tried purchasing and recycling old wool sweaters by felting them and making them into new creations, I have to say I find it more enjoyable to create new crochet designs and felt them. 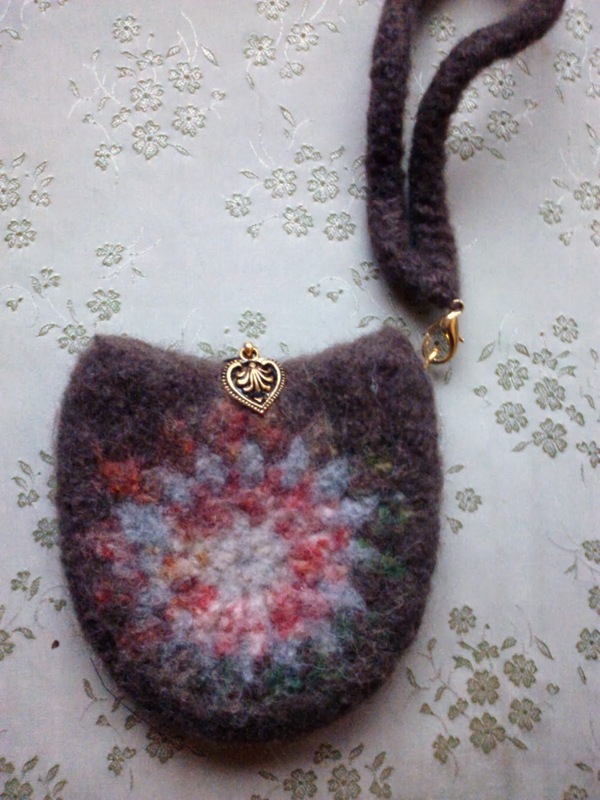 Recently, I created some new, small, felted bags that I crochet all in one piece, in a manner somewhat similar to the Simple Felted Crocheted Purse, for which I posted the pattern in October. I call these new little purses my "Just the Essentials" bags, because they are designed to carry your phone, your keys, your id and/or credit cards, and a bit of cash (depending on the size of your phone, you might also fit in your lip gloss) -- only the things you really need when you are out and about and don't want to be saddled with a big, heavy purse. The bags have a long strap, so you can wear them cross-body or over your shoulder. All of the one-of-a-kind embellishments on these bitty felted bags are either crocheted and then sewn onto the purse, or embroidered directly on the purse. 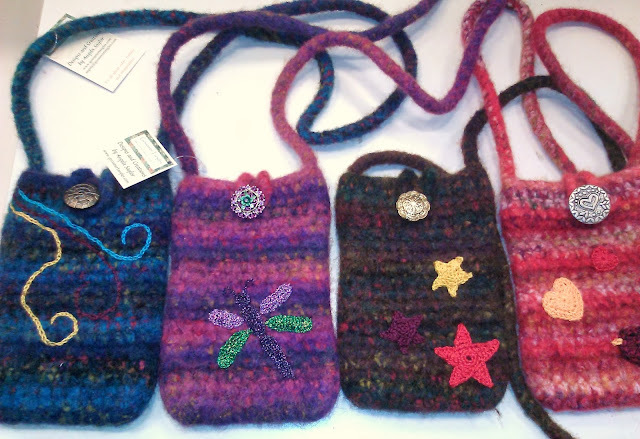 I took these photos using my phone at Art Is In Market at Laurel Park Place Mall where I have the purses for sale. I apologize for the quality of the pictures, but they're the best I could do with my phone (I forgot my camera -- another "bacon*" event I'll chalk up to being overwhelmingly busy). *Note: "Bacon" is my son's substitute for a whole variety of expletives. Hence, the title of his comic strip, "Bleeping Bacon Bits". I kind of like it, so I've adopted it.